League of Angels II, the most epic MMORPG of 2016 from GTArcade, has entered a brand new era: Now is the time of Battle Pets! Various mythical creatures and companions have come to Sapphire to support our heroes in their struggles! All players level 65 and above will receive a free Battle Pet. But how can we make our new pets stronger? The new game mode “Battle Royale” has the answer! New Battle Royale Provides Pet Resources! 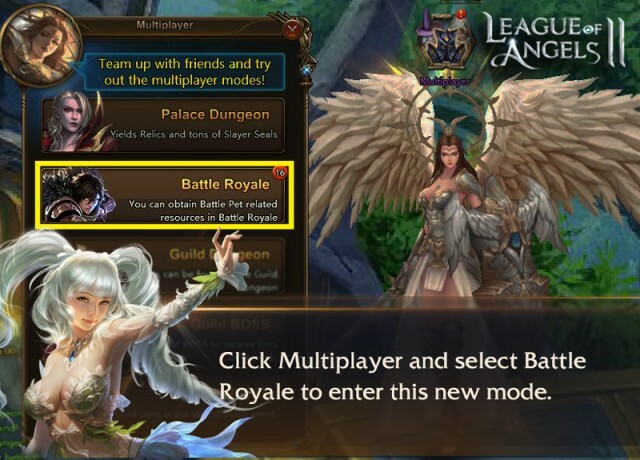 Players that have reached level 65 can click Multiplayer and select Battle Royale to enter this new mode. The mode includes 4 stages of varying difficulty against randomly matched cross-server opponents (based on B.R.) that are refreshed daily. Players must first select enemy in the first column to challenge. 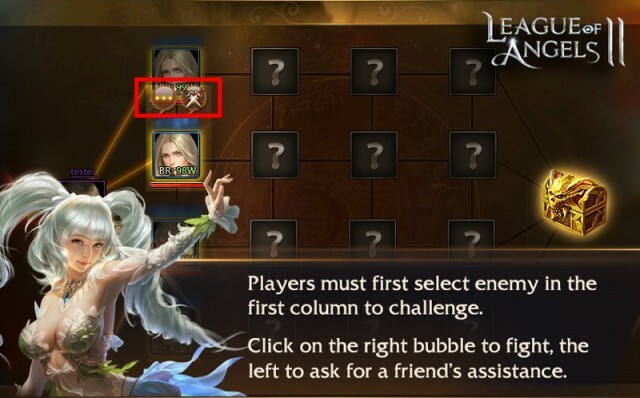 If the player cannot defeat the enemy, they can click on the left bubble above the enemy to ask for a friend’s assistance (use their squad to battle). 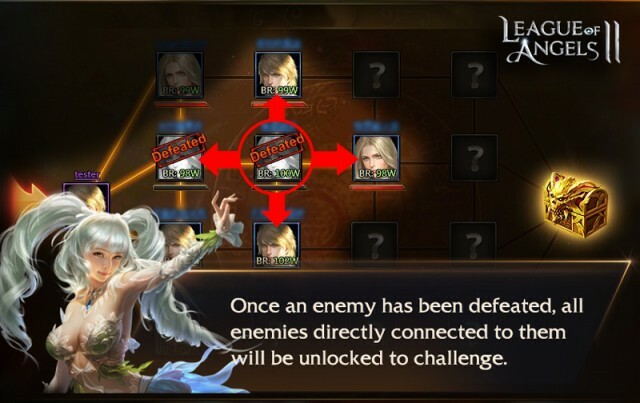 Once an enemy has been defeated, all enemies directly connected to them will be unlocked to challenge. Work your way to the right side, and defeat any of the enemies in the final column to access the reward chest for that stage. Players can then move on to the next stage. 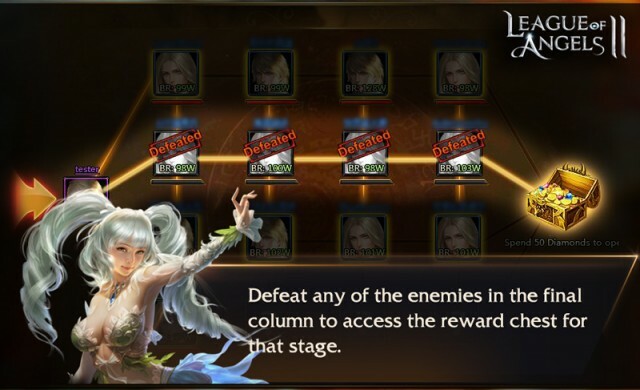 If players fails a challenge, the enemy will receive a debuff and their HP will not recover from the last battle, so the battle will be easier. When players defeat an enemy in Battle Royale, they will earn credits and Dragon Crests (a loss will earn half the rewards). When reaching certain credit amounts, players can claim corresponding rewards. 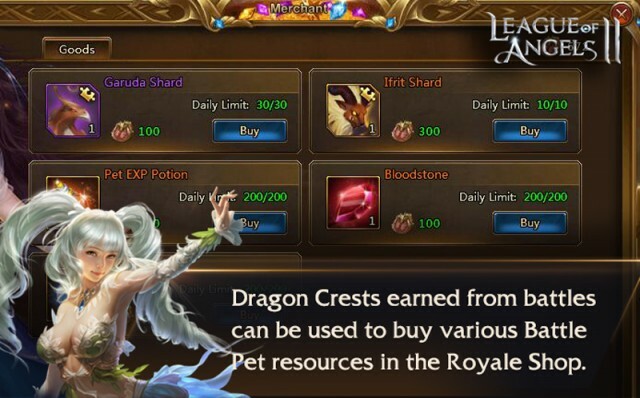 Dragon Crests can be used to buy various Battle Pet resources in the Royale Shop. Help Friends And Be Rewarded! Players can use the Assist feature borrow the more powerful squads of their friends to challenge enemies. The Angels will recognize these good deeds and reward the most helpful warriors! The top 10 players who have successfully assisted the most friends will be ranked on the Assist Rankings and earn extra rewards. Since assists are based on the number of friends that use your squad, your best chance to top the rankings is to have a powerful squad and lots of friends! Battle Pets is just the latest exciting new feature to hit League of Angels II. For now, go forth and conquer the new Battle Royale, cultivate your new faithful companions, and watch your B.R soar! More amazing content is coming soon so stay tuned!